I am the Resurrection and the Life; whoever believes in me, even if he dies, will live, and everyone who lives and believes in me will never die (John 11:25-26). Below are the names (CONTACTS) of those who can help you in scheduling and planning the funeral Mass for your loved one. Underneath those are the Funeral Guidelines to aid you in the preparation of the details of your loved one’s final celebration. Scroll down to the section, Liturgy of the Word, to find a link to a selection of readings as well as a downloadable form to write down your reading selections, etc. For a brief list of funeral info, click here for a funeral planning checklist. May Our Lord watch over you and comfort you during this time of sorrow. Scheduling a Funeral: Funeral Masses are normally celebrated at St. Therese Church at 10:00 a.m., between Monday and Saturday. If you do not plan to have a vigil the night before the funeral, it is suggested that you begin the Mass with a Rosary. This is normally done at 9:30 a.m. (before the funeral Mass). If these times are not convenient, we will be happy to work with you to find another time—depending on clergy and church availability. The first step to take when planning a funeral liturgy is to contact the church offices (SEE BOXES ABOVE) or have the funeral home you’re working with contact us. The Parish Secretary will obtain the basic information about your deceased loved one, as well as the preferred funeral date and time and any preferred priest. Once the date and time are scheduled, and the celebrant is chosen, the funeral date will be confirmed. Fees: See info at bottom of the Guidelines. · Introductory Rites: The body is sprinkled with holy water and covered with a white ceremonial cloth called a pall, a reminder of baptism. The assembly joins together in a gathering song, and the presider leads the opening prayer. The family joins in the procession, following the priest or deacon, and is seated in the pews on either side at the front of the church. · Liturgy of the Word: Readings from the Old Testament and the New Testament are proclaimed, followed by the homily and the Prayers of the Faithful. To select the READINGS for the funeral Mass in English, click here (x). To select the READINGS for the funeral Mass in Spanish, click here (x). To select the PRAYERS OF THE FAITHFUL (English only), click here (x). Return the form to denisekay@hotmail.com at least one day before the funeral. You may also bring to the office at least one day before the funeral. For a FORM on which to enter your preferences for the Scripture readings, click here (X). Once you have filled out the form, e-mail it to the Parish Secretary at denisekay@hotmail.com. If you prefer, you may also stop by the Parish Offices (510 North El Molino Street, Alhambra) to pick up a funeral planning booklet (“Through Death to Life”), which has the same suggested readings and a selection form. 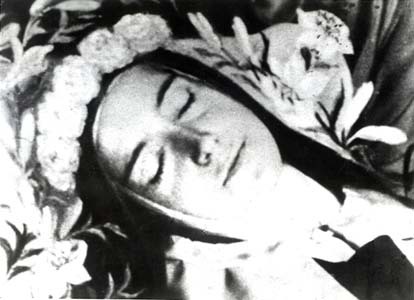 Note about Eulogies: As per the General Instructions of the Roman Missal (GIRM), which regulates the celebration of Mass, St. Therese Church does NOT allow eulogies to be given at our funeral Masses (The GIRM states, "At the Funeral Mass there should, as a rule, be a short homily, but never a eulogy of any kind" - Chapter VIII, No. 382). The celebrant will give a short homily after the Gospel, but not a eulogy. If family members would like to deliver eulogies, they may do so at a vigil the night before the funeral (after the Rosary, prayers, etc), at the gravesite, or at any reception held after the services (be sure that anyone giving a eulogy is emotionally able to do so). Moreover, we do not allow “welcomes” or “closing remarks” to be offered by anyone other than the priest. · Liturgy of the Eucharist: The gifts of bread and wine are presented and blessed, followed by the Eucharistic Prayer. The assembly then joins in the Lord’s Prayer, exchanges the sign of peace with one another, and receives the Eucharist. Note about Receiving Holy Communion: While all Christians are united in charity, prayer, and a common baptism, those within the Catholic tradition believe that the Eucharist, the true Body and Blood of Jesus, is also a sign of our full communion in Faith. While full unity continues to be our prayer, until such full communion can be recognized among Christians, reception of the Eucharist is reserved for practicing Catholics who are in the state of grace. All who are not receiving are welcome to either remain in their seats in prayer or come forward to receive a blessing, indicating their desire for such blessing by crossing their arms over their chests. · Concluding Rites, Final Commendation, and Farewell: The celebration is formally closed, and the body is honored with incense before being taken to the place of burial. · The Committal or Burial Service: This last stage of the Order of Christian Funerals is celebrated at the place where the body of the deceased will be buried. At the cemetery the faithful again proclaim their belief in the Resurrection for themselves and for the one who has died. The service normally consists of a short prayer, a reading from Scripture, and prayers of intercession. You may also deliver eulogies here. · Bring forward the gifts of bread and wine. Music at the Funeral Mass: Music is a very important part of the funeral celebration, and you may already have some ideas about what songs you’d like included. Our Music Director/Organist, Charlotte Lansberg, will work with you to help select the music. Please note that all music must be liturgical. St. Therese Church policy is that we do not *allow outside musicians but only our own musicians to serve as organist/pianist and cantor (the cantor leads the assembly in the singing.) (*except under extraordinary circumstances). Note about recorded music: Please note that we do NOT allow recorded music at funeral Masses. The General Instruction of the Roman Missal (GIRM) states in Nos. 39-40: "The Christian faithful who gather together as one to await the Lord's coming are instructed by the Apostle Paul to sing together Psalms, hymns, and spiritual songs (Coloss. 3:16). Great importance should therefore be attached to the use of singing in the celebration of the Mass.” The reason for this is that the use of music in the liturgy is always to enhance the quality of liturgical prayer and can never be considered as entertainment. It is practically impossible for recorded music to serve the same function. Sanctuary: Please do not enter the sanctuary (altar area). This is only for priests, deacons, and those participating in the ministry of the altar (servers, lectors, extraordinary ministers of Holy Communion, etc.). Vigils: If you have arranged with the funeral home for a vigil the night before the funeral, this will normally be held at the funeral home; vigils are not normally held at St. Therese Church unless you are expecting an amount of people attending that the mortuary cannot hold. If available, we will arrange for a deacon to go to the funeral home to lead the prayer service at the vigil. Again, you may also deliver eulogies during the vigil (after the prayer service). Flowers: Your family and friends are welcome to have flowers delivered to the church before the funeral. Outside of the seasons of Advent and Lent, we are happy to keep and use any of these plants or arrangements that you may wish to leave in the church after the liturgy is over. However, during Advent and Lent, you must arrange to take the flowers with you. Suggested local florists are: Alhambra Main Florist at (626) 282-7518 OR Mercados at (626) 293-8155. Picture Displays: You are allowed to bring photos of the deceased to be displayed during the funeral Mass. We have easels on which you may place them; the funeral home will help you to display them in the proper place. Please arrange to have someone from your family remove these after the liturgy. Eulogies: As indicated above (under Liturgy of the Word) and repeated here, per the General Instructions of the Roman Missal (GIRM), Chapter VIII, No. 382, which regulates the celebration of Mass, St. Therese Church does NOT allow eulogies to be given at our funeral Masses. According to the Order of Christian Funerals, there is never to be a eulogy at a funeral Mass (OCF 27). Contrary to common assumption, the purpose of the funeral Mass is not to celebrate the life of the deceased but to offer worship to God for Christ’s victory over death, to comfort the mourners with prayers, and to pray for the soul of the deceased. Relatives or friends who wish to speak of the deceased’s character and accomplishments can do so at a prayer service to be held in a home or funeral home or at the graveside following the rite of committal. Funeral Reception: If you would like to host a reception following the liturgy or the burial, you may use our Parish Hall (IF it's on a weekend or at a time when there is no school) OR the Guadalupe Courtyard—depending upon availability. The family of the deceased provides and pays for the food. We can provide you with a list of caterers we work with regularly, or you may bring in food of your choice. The use of the PARISH HALL is subject to availability, but, again, it cannot be used during School hours. There is a fee of $200 for the use of the PARISH HALL (usage fee, $100; and cleaning fee, $100). There is a fee of $150 for the use of the GUADALUPE COURTYARD (usage fee, $100; and cleaning fee, $50) for a reception of a funeral held in our church (the family must set up any additional tables and chairs AND take them back down). Cremation: Since Vatican II, it has become more common for families to choose cremation of a deceased loved one rather than burial of the body (for convenience or for economic reasons). The funeral Mass may be celebrated in the presence of cremated remains. The remains are to be placed in an appropriate container and then put on a table or stand in the place normally occupied by the casket. The remains may be carried to their place during the entrance procession. The container is not covered by a pall. The cremated remains are to be treated with the same respect given to the human body from which they came. This includes the use of a suitably-dignified urn to contain the ashes and reverent respect in transporting them to their final resting place. Nothing should be done with the ashes that would not be done with the body. Church / Music Fees: Very often, the funeral home takes care of the financial arrangements (they pay the church and then bill the family). Concerning our fees, rather than issuing separate checks (to the church, the organist, the cantor), please issue—or have issued by the funeral home—one check for the total to St. Therese Church. Our preference is to receive the check from the funeral home. However, if the family will be the one issuing the check, we require that it be given to us at least two days in advance of the funeral service. Altar Servers' Stipends: There are two servers assisting at each funeral Mass in English--each of whom should receive a stipend of $10 each IF the funeral is outside school hours. For a Funeral Mass in the Latin Rite, the fee for each altar server is $50 each. Please appoint a family member to pay each server before or immediately after the funeral service (altar servers' stipends are NOT included in the fees shown below).